US Dimes were authorized by the Coinage Act of 1792. In this Act, also known as the Mint Act, the United States Congress established the United States Mint and created a decimal system for U.S. currency. The dollar was set as the unit of money in the United States and was declared to be lawful tender. The Act of 1792 also authorized the mintage of the "disme" which would be 1/10th of the silver weight and value of a unit or dollar. Disme (pronounced 'deem') is French for tithe or tenth part. 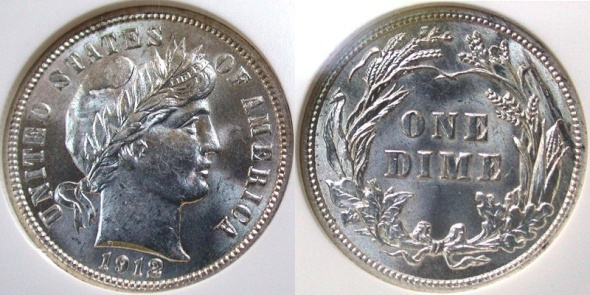 In 1792, the disme was created as a pattern coin but never saw circulation. The first US dimes that were created for circulation were the Draped Bust Type in 1796. 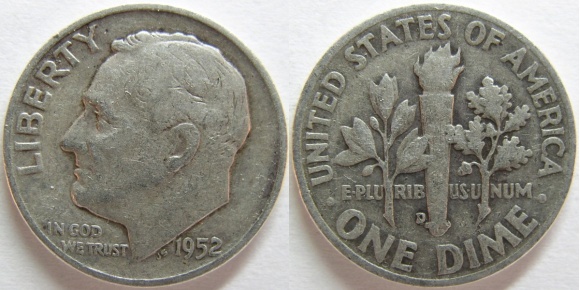 These dime pieces were not marked with their denomination however. US Dimes would not see a mark denoting value until 1809 when the Capped Bust Dime was marked with "10 C." on the reverse. Listed below are the US Dimes along with an image and a short description. Click the links for more information and stats. Liberty Seated Dime (1837-1891) - The Liberty Seated Dime piece is a US dime piece or ten cent coin that was produced from 1837 to 1891. 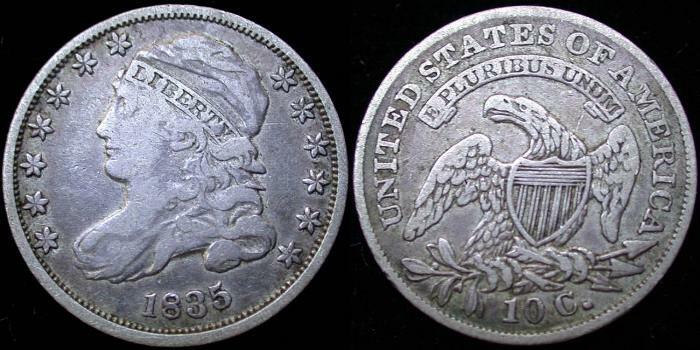 The Seated Liberty design appeared on just about every silver US coin from 1836 to 1891. Other US coins that share the design are the half dime, twenty cent piece, quarter dollar, half dollar and silver dollar. Barber or Liberty Head Dime (1892-1916) - The Barber Dime or Liberty Head Dime is a US ten cent coin that was produced from 1892 to 1916. It gets its nickname from Charles E. Barber who designed it. A quarter dollar and half dollar from the same time period also bear his name. Mercury or Winged Liberty Head Dime (1916-1945) - The Winged Liberty Head Dime is more commonly known by most people as the Mercury Dime. It gets its nickname from the wings that are attached to Liberty's cap, giving her the appearance of the Roman god Mercury. Roosevelt Dime (1946 to date) - The Roosevelt Dime was made to honor the 32nd President of the United States, Franklin Delano Roosevelt. The dime was chosen as the coin to bear his likeness because of all the work he did to help found and promote the March of Dimes.